If you have used our services and would like to share your experience, we would love to hear from you! Provide us with your testimonial and we can include it on our website. After a year or more of trying to avoid surgery for torn left shoulder labrum, going through Physical Therapy and still trying to compete as a powerlifter, I was at my wits end for a solution. I started researching alternative medicine and found out that Dr. Kim performed Stem Cell in Cedar Rapids. I called and set up an appointment in late 2017. At Dr. Kim’s office, I received Stem Cell Therapy and a Platelet Rich Plasma Injection in January of 2018. That was followed up by laser treatments, and two booster PRP shots. I elected to do the rehab on my own with my trainer because I wanted it to be specific to my sport of powerlifting. When I came to see Dr. Kim, I had significant pain and minimal use of my left arm through the shoulder joint. I was unable to perform simple tasks like put on a shirt, put the milk away in the refrigerator or turn the steering wheel in my truck without excruciating pain. As a powerlifter, I had come from bench pressing 500 lbs to not being able to do these simple tasks. After receiving Stem Cell Therapy and the PRP shots, I was able to slowly rehab and I now rate my improvement at 95% after one year, and without surgery. I would definitely recommend others to come to the Progressive Rehabilitation Medicine for alternatives to surgery. The recovery takes the same amount of time as conventional surgery but with much fewer risk, much less pain and no hospital stay. Basically you can continue to live your life as normal while the Stem Cells from your own body grow new tissue and heal you. It’s amazing science. My knee problems began about four years ago. After an especially long hard day at work my knee became stiff and sore. After a month the stiffness went away and I thought I was O.K. So I started running again to into better shape. One day I woke up and my knee was really sore, it hurt with every step. I went to the hospital and had x-rays taken. I was diagnosed with moderate to severe osteoarthritis. I was given some physical therapy and a cortisone injection. This helped the pain but was only effective for about a month and a half! Since I was only allowed 4 shots per year I was in pain about half the year. Taking advil was only marginally effective even though I was taking it almost daily. When discussing my options with an orthopedic surgeon I learned I really had few options. I was told that my problem would get progressively worse and that at some point the pain would be so severe that I would need a knee replacement. The problem was painful enough that I had a noticeable limp. After learning about Dr. Kim I made an appointment and had a PRP injection. This greatly reduced the pain and my knee was much better for about one year. About six months ago, when the pain became more intense I decided to have a stem cell injection. The procedure was nearly painless and I began noticing improvements within the first week. Since then I have made steady progress almost weekly. Now I have almost no pain and do not need any pain medication. Since the procedure requires more than one year to achieve the full benefits I am looking forward to continual improvements. Even if I do not experience additional improvement I feel the procedure was well worth it. Before I had pain with every step, now I have days with zero pain and any pain that I have now is so mild it is negligible. I came to Progressive Rehabilitation Medicine, PLC with an arthritic knee that could not be replaced because of damage from a motorcycle accident. Dr Kim fitted me with a knee brace and I received 5 injections into my knee, one every week. I am walking now with practically NO pain. Thank you Dr. Kim and staff. 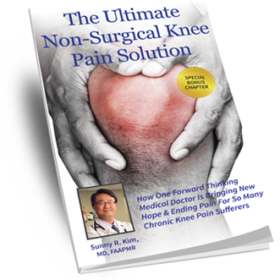 Haven’t been able to walk without knee pain for 10+ years until I met Dr. Kim. I don’t even limp any more. I had suffered form Plantar Faciitis in my left foot for almost three years. I tried everything; exercises, orthotics, cortizone shots. I was stretching for 45 minutes every day. Nothing helped, in fact my right foot started hurting am much as my left. I was almost to the point of depression, since I was so limited in my activities due to the pain. I search the internet for solutions and discovered Dr. Kim. I had the PRP injection in my left foot in September 2013 and my right foot in December 2013. I still have a little pain occasionally, but it doesn’t limit my activities. In fact, a couple weeks ago, I had to walk 7 miles pushing my bicycle with a flat tire. Later that day, I had some pain in my right foot, but it didn’t last long. My life is so much better now. Also, I planned to wait until Spring to have my right foot done, but was informed in December that I was being kicked off my husband’s insurance plan. I called Dr. Kim’s office and explained the situation and they set up an appointment before the end of the year; saving me a lot of money. Thank you. I am so very thankful that I found Dr. Kim. I have suffered from migraines and neck pain for several years. After receiving treatment from Dr. Kim I have found significant relief. I have seen other Dr’s however never received much relief. I would highly recommend Dr Kim. His staff is wonderful as well. I had a rotator cuff tear in my left shoulder that had not healed even after a year. My chiropractor had done some Active Release Technique which gave temporary relief from the pain, but she recommended I see Dr Kim about Platelet Rich Plasma injections. I was skeptical, but I trusted her judgement, and I did not want to undergo surgery. I had one injection, which was not traumatic at all. There was a little soreness after the procedure but within a couple of days the soreness was gone. Now, after six weeks, the tear has healed by about 95% and the pain has improved the same. With a few more weeks of healing, I should be 100%. I am very grateful that I was given this option. I had a cervical fusion (C4,5 & 6) 6 years ago, the result of two bad car accidents when I was younger. I fought neck pain most of my adult life. Upon getting older arthritis set in my neck due to the damage over the years and it created large bone spurs which my nerves were wrapped around and tangled horribly. Before the fusion and removal of these bone spurs I was in a 8/10 pain range everyday. After the fusion I had minor relief, many doctors reviewed and stated I had Cervical Spondylosis and neuropathy. Over the next 6 six years since the fusion my life was lost, little by little. I lived on pain killers as the pain never went away. I had to give up most everything that brought joy to my life… My Primary Care Doctor referred me to Dr. Kim as a hope of relieving some of my pain. Dr. Kim has done one round of Botox injections as within minutes of seeing me he diagnosed Cervical Dystonia which no other Dr. had caught. The first round brought me a lot of relief, there are days where I’m in half of the pain and that is HUGE with me! We have formulated a plan… to try and reduce the pain even more. I’m not expecting to ever be totally pain free but this man, the Dr. has brought me more hope than I’ve ever had in my 40+ years of dealing with this. I would highly recommend anyone with chronic pain due to spine/cervical injuries to see Dr. Kim, I feel his treatments have saved my life…I pray that Dr. Kim never leaves Cedar Rapids as he has brought hope back into my life. I have been suffering with neuropathy in my feet and legs for a few years. Many nights I could not sleep and would sit in my rocker with ice packs and take pain medicine to even endure the pain. Several doctors told me there was nothing to do for this problem–there was no help. My husband read an article in the C.R. Gazette about a new method Dr. Kim was using to help this disease. He urged me to go talk to the doctor and we decided to take the treatments he offered. We are so happy that we did, for I have received much help. I now sleep all night long without pain. If I experience a recurrent pain, it only lasts for a short while and is not nearly as painful. I am so grateful to Dr. Kim for his help. His nurses and office personnel are so helpful and caring. I could not ask for a more efficient office staff. All this help along with much prayer have made a big difference in my health. I would recommend this office to all who are in pain. I have been getting BOTOX injections in my neck every 3 months for a little over a year. Their treatments have been very beneficial to me. I have had neck problems my whole life, neck pain and stiffness, headaches and no mobility. Since I have had these treatments most of the time I have little to no pain. Their treatments have made a tremendous difference in my life. Thoughts on SpineMed Therapy; the Experience. Progressive Rehabilitation Medicine, PLC The Physiatrist was a new concept that was little understood by me. This is a specialized field dealing with pain and has been around since the 1930’s. The new technology with spinal decompression was new to me and I am glad I took a friends recommendation to check the clinic out. My dad had traction years ago after his stint in the navy; and this technical advance is 5 generations past that. In my younger years, I worked in the sheet metal trade that required heavy lifting. That abuse of my body has come full circle. At the age of 45, I had an injury that changed my direction in life that has nothing to do with my current circumstance. I have been out of the trade since 1999 so the daily abuse stopped; but the cumulative damage to my spine continued its progression in the form of arthritis. In the last few years, I have been fighting a brain tumor I was on chemo for 30 months, and that left my mobility sporadic; I started having pain in my hips and over the progression of years this pain has become severe. I began to have pain along my spine in the thoracic area. I was using chiropractic services to no avail, after six weeks of therapy four days a week. I came to realize that for my condition, chiropractic was not working. I had so much pain I could not sleep without a narcotic painkiller and that relief was only marginal. I came to Dr. Kim’s clinic at St. Luke’s, in October 2012, he did some pain management for the short term; at the same time he also ordered an MRI of my spine. It showed severe arthritis in the L4-L5, and L5-L5SI, with complete compression of the discs in those joints. After a consult with Dr. Kim, I decided that spinal decompression should be my first option instead of opting for a spinal fusion. At the time I had some doubts about decompression, being in the medical field, I did my research and found that significant progress had been made over the years in technique and associated elevated positive out comes. We decided that twenty treatments, four times a week would be a start, and then analyze the results after finishing the treatment plan. The treatment was painless for me and after about 4 treatments, I noticed that my pain level had dropped from 8/10 to 2/10. After 8 treatments it dropped to zero, I understand that my progression was very fast considering my condition and severity of my spine injury. I am maintaining a near zero pain level 7 weeks out. The staff at Dr. Kim’s clinic are professional, friendly, and are well educated in the treatment of pain management. Bob May was my technician and was of great help on advising me on how to use my back brace and the exercise that would help me recover quickly. I am currently on a maintenance program while my body continues to heal. 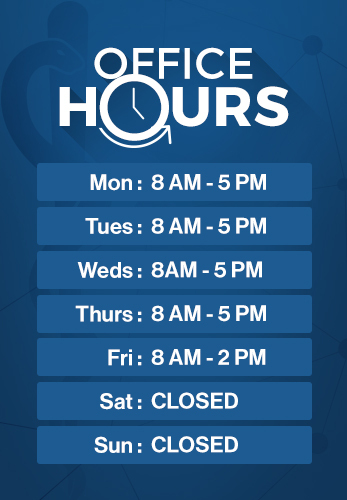 The staff is always willing to help you with any questions you have. I would give them an overall 10, and yes, I would definitely recommend them to help you overcome your condition. I sought out treatment from Dr. Kim knowing he is on top of state of the art non surgical approaches. I’m relatively young and had a nasty rotator cuff injury and wanted to avoid surgery at all costs, even though it was advised by another doctor. I had a partial tear of a major ligament, and had injured some of the muscles in the shoulder. I knew that a nonsurgical approach would take more effort from me to be successful and was willing do to the work. Through a combination of prolotherapy, PRP, physical therapy, topical medications, and laser treatment, my pain was quickly relieved. I am extremely happy to share with others that my shoulder is completely healed, and I got my wish of not having to undergo surgery. I really appreciate having had treatment from a team that listened to my preferences and helped get me back in shape! My wife had been having trouble with her shoulder. We had been to an orthopedic surgeon and had had MRI’s and then was sent to Dr. Kim for an EMG. We found she had severe nerve and muscle damage in her shoulder. After several sessions with a physical therapist Dr Kim recommended PRP to the damaged nerves. We were hesitant at first, but we said ok. It has been one month since the procedure and she has full mobility and no pain. She is completely back to normal with the exception she needs to build up her strength again, but overall she is almost as good as new. Had been bothered with arthritis for a few years and thought knee pain was a continuation. When cortisone injection gave no relief was scheduled for MRI, which showed a torn tendon above the knee, which normally would have required surgery. PRP Injection over a year ago and am able to go up and down stairs, relatively pain free. Oh yes it has also improved my arthrits knee problem. Before the PRP injection there was pain, it woke me up at night, I could not sleep, could not raise my arm level to my shoulder. I could not lift a gallon of milk. I had cortisone shots. I had surgery twice and the pain came back. After the PRP injection, I have no pain. I can, now, touch my left ear with my right arm[reaching overhead]. That says a lot because I just could not do this. For 40 years I had not been able to do that. This is the truth and I’m not exaggerating. I would recommend PRP to anybody in the world. If they got pain, go PRP. All I have to say about Dr. Kim’s clinic is good. The nurses are polite. The service is prompt. Once Dr. Kim diagnosed my problem, he knew exactly what to do. I did not have to keep coming back over and over. It has changed my life. I was a victim of a motor vehicle accident in 2008. I experienced failed back surgery syndrome following my first surgery. As a result of this, I went through a second surgery that same year. I was frustrated with the decisions that were not made following my first surgery. Following my second surgery, I decided to go to St. Luke’s Therapy Plus for my rehab where I started seeing Dr. Sunny Kim. Through Dr. Kim we began sessions of Trigger Point Dry Needling which helped with my tight muscles. Following those sessions, I began sessions with the SpineMed decompression bed. I felt great relief through those daily treatments . . . nerve pain gone; realignment of spine; less of the feeling of sensitivity in the surgical area; and definitely a better quality of life! I also have been treated with LiteCure deep tissue therapy to increase blood flow and to help with pain and inflamation. The SpineMed and LiteCure treatments are calming and noninvasive. Throughout this rehab time I continued with my physical therapy exercises. A piece of advice Dr. Kim gave me before I started these sessions was to try to keep your stress level in your life down . . . this can affect the healing process. I fully agree as I unfortunately have experienced this first hand. Dr. Kim is one of the most understanding doctors that I have experienced in my life. He listens and understands how I have been feeling. Based on this he knows what needs to transpire during my session. Dr. Kim’s pro-activeness in his field is a blessing to me and to the community. I was suffering back and shoulder pain that was the result of a motor vehicle accident. Before receiving treatments from Dr. Kim I could not bend past my knees and had pain down my left leg. I had pain from my left shoulder running down my arm and my left hand was numb. I was treated with regenerative injection therapy and have had no pain or numbness since. I have recomended Dr. Kim to family and friends and would not hesitate to seek further treatments from him if needed in the future. I have been dealing with arthritic knees for several years. Then about 2 years ago I was put on cymbalta for fibromyalgia, but the pain increased so the dosage was increased. I began to have serious side effects from the medicine. A friend told me I should see Dr. Sunny Kim for my knees. Upon researching his name I found he could provide relief for my fibromyalgia. I was in bad shape and anxious to try something different.That day he told me to have X-rays of both knees and start physical therapy for strengthening and balance and become more active. He also suggested a special diet.For the fibromyalgia he recommended trigger point needling.It is a process of inserting small needles into the neck and back to alleviate pressure on the nervous system.The procedure does not take long and is short with minimal pain.I also recieved shots in my knees with hyalgan over 5 weeks.After each treatment, the throbbing pain improved.I totally recommend this for everyone to try who is dealing with severe pain.I felt he truly cared about my well-being.Today my pain is minimal and in addition I have lost 30 lbs. This is just the beginning of trying to live a healthier life. Hats off to Dr. Kim. For over 10 years I have suffered from pain that woke me over and over every night. A constant grinding pain running down my left leg into my foot. Pain that worsened with most any activity, and was only lessened by medication. I forced myself to keep moving and tried to continue the activities that I used to love prior to the onset of this nightmare (within limitations). I failed two back surgeries and when I refused the 3rd offer to see a surgeon, was “prned” or fired from my latest doctor. My friend encouraged me to see Dr Kim, when I was having such terrible muscle spasms that it was making it difficult to even walk. Because of Dr Kim, I am pain free most of the time, and I am thankful for the work that he put into helping me. He cares about his patient’s, and takes the problems home with him. (I know, because he figured out one of the complications contributing to my slow recovery while sitting at home!) Years of compensating in order to walk, or limping; had caused its’ own set of problems. Dr Kim has brought back my life. I am off of all of the medications that I once could not function without. He strongly encouraged me to continue the physical therapy and spoke with them to keep my recovery on track!! I have never had a physician do anything like that!! I spent a small fortune trying to find some relief before I came to him. He was worth every penny I spent after insurance. I only wish I had found him sooner. I just wanted to add to my testimonial from a couple of years ago, because at the time I wondered if I would have to continue to return for treatments in order to keep myself painfree…I just wanted to let those of you considering this treatment[SpineMED decompression]know that – the improvement can last! I do my exercises and work to maintain a strong core as directed by Dr Kim after completing the treatments on the table, and I remain almost completely pain free to this day. I sleep at night without pain or sleep medications. I will not hesitate to return should I ever need him again. My only regret is that I did not meet Dr Kim prior to my very first back surgery. I send everyone I meet with back and pain issues his way as I do believe in what he does. Thank you Dr Kim!!!! I’ve experienced shoulder pain for a year. Finally I went to my physician who arranged for an MRI. The results showed a torn rotator cuff and my Doctor planned to refer me to a surgeon. Now I’ve already had 2 shoulder surgeries so I wasn’t looking forward to another. I had heard of Dr. Kim’s practice and the light therapy. I was willing to try anything before succumbing to another surgery. Dr. Kim gave me six treatments using the laser. I recently had a follow-up visit and told Dr. Kim my shoulder felt much better. I would highly recommend this therapy over something invasive. I have to admit, I was surprised by the outcome and am very glad I went this route instead of surgery. Please consider this avenue before anything invasive. Dr. Kim and his Nurse took very good care of me and I am happy to recommend his practice. I have had an elbow injury for well over a year. I had therapy, which helped a great deal, but still had pain. The PRP injection has seemed to get me over the hump, and allowed my injury to continue to improve, rather than plateau where it had been. I must comment on Dr. Kim as well. He really impressed me with how personable he was and how he listens to his patients. He didn’t treat me as just another number, but really listened to what I had to say and dealt with my injury on a personal level. I truly appreciated that and felt in his doing so, I was able to get excellent care! Thank you Dr. Kim and your staff!! I had low back pain, tingling and numbness in my right leg from the knee down to my foot. I made the usual rounds to get a diagnosis and help. I started with my medical Doctor who had an xray done of my lower back which showed arthritic changes and I was referred to a back specialist but my appointment was not for one month. So I saw a physical therapist for four therapy sessions which did help but the numbness and tingling did not entirely go away. When I saw the specialist he thought an injection in my low back would help. It did not. Since I had knee replacement surgery on my right leg, I went to the orthopedic Doctor to make sure that was o.k. Then an MRI was ordered which showed a large bulging disc in my lower back. I was referred to Dr. Kim and had six laser treatments on my lower back and leg. He thought that besides the bulging disc pinching a nerve that I also had chronic tendinitis . The treatments gave me relief and besides some residual numbness behind the knee I am pain free. If you have experienced the frustration of trying to get help for the type of problem I described, I certainly suggest seeing Dr. Kim. He was very empathetic and caring and so were his nurse and the assistant who gave the treatments which were short and painless. *Progressive Rehabilitation Medicine has made every attempt to ensure the accuracy and reliability of the information provided on this website. However, the information is provided “as is” without warranty, promises and/or representation of any kind. PRM does not accept any responsibility or liability for the accuracy, content, completeness, legality, or reliability of the information contained on the website. There’s no guarantee of specific results and the results can vary. It depends on individual experience of each customer.